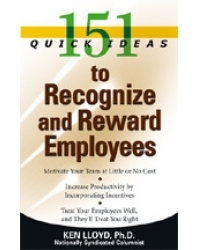 Reward Employees will help managers stock up. productivity, commitment, and overall performance. restaurant, managers tend to choose the same old kinds of recognition and rewards. • Awarding special coupons for free gasoline or transportation. • Hiring a masseuse to rub out stiff necks and backs. • Making your employees more invested by offering profit-sharing. • Plus many free or low-cost rewards. a roadmap to bring the idea to life. NPR, and Fox Morning News.